Starting with the 2006 vintage, Chateau Haut Brion is incorporating one of its oldest labels, La Tour Haut Brion, into the Chateau’s other wines, specifically the second wine of La Mission Haut Brion called La Chapelle de La Mission Haut Brion. As the vines age past their present 21 years they may also be used in La Mission Haut Brion. The one discernible difference in La Chapelle de La Mission Haut Brion will be the amount of Cabernet Franc (28% in 2006) which comes from the La Tour Haut Brion vines. 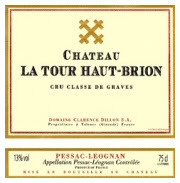 According to Haut Brion owner Clarence Dillon, the issue was one of simplification. We can’t help but note that La Tour Haut Brion is much simpler a name than La Chapelle de la Mission Haut Brion – phew!